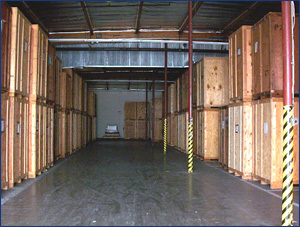 We store everything in vaults, which are large wooden crates approximately 7 ft long, 5 ft wide and 8 ft tall. We charge only $59 per month for each vault. . There is no charge for the first month's rent (provided you use our moving service to move you both in and out), and after that your charges are pro-rated. If you stay in our storage for one month and one day, then all you pay for is one day! We come to your residence, make a complete inventory of everything you ask us to store for you and carefully wrap your furniture. We then load your belongings onto one of our trucks and bring them back to our warehouse., where everything is then packed into our storage vaults. Everything inside will be safe, secure and dust-free.